If your child loses a tooth from an injury, try to remain calm. Call our office immediately and we will help you to determine if it is a permanent or primary tooth. If it is a permanent tooth, avoid touching the root in any way. If it is a permanent tooth, gently rinse the tooth under running water, but avoid rubbing the root area. Hold it by the crown rather than the root and try to reinsert it in the socket. (Your child can keep it in place until treatment by biting down on a wet piece of clean gauze.) If that is not possible, put the tooth in a glass of milk, saline solution, or saliva, and take your child and the glass immediately to our office, or an emergency medical treatment facility. For a broken tooth, rinse your child's mouth out with warm water to clean out any debris or foreign matter. Use a cold compress on the child's cheek or gum near the affected area to keep any swelling down. Call our office immediately. Minor fractures may be smoothed with a sandpaper disc or simply left alone. Another option is to restore the tooth with a composite restoration. In either case, treat the tooth with care for several days. Keep your child on a soft diet that avoids use of the broken tooth. Moderate fractures include damage to the enamel, dentin (the bony hard portion of the tooth), and/or pulp (the nerve and blood vessels within the tooth). If the pulp is involved, the tooth may need a nerve treatment, including the possibility of a root cnal in order to save it. The tooth may be restored with a composite filling or a permanent crown. If damage to the pulp does occur, further dental treatment will be required. 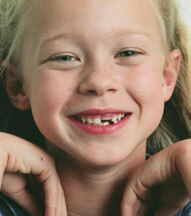 Severe fractures often mean a traumatized tooth with slim chance of recovery.